For the serious consumer, the LG DLGX3361V steam dryer should be a good solution. This Ultra-Capacity dryer comes with not only 12 drying programs but also with great features and technologies that ensure the dryness and cleanliness of each load. 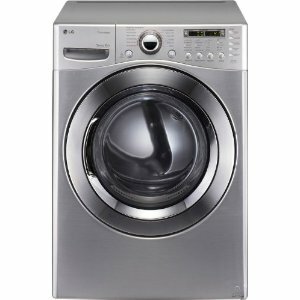 Buying this separate dryer should not even be a problem in terms of space as it is stackable with a compatible washer. The LG DLGX3361V comes with 12 different drying programs. So, there is a program for just about any type of drying need. The SteamSanitary program sanitizes garments that are supposedly non-washable. The EasyIron option, on the other hand, prepares the garments for easier ironing. The iron can easily glide on the fabrics. There are many other specialized programs that the consumer may be interested in. With its trademark LG LoDecibel Motor, the consumer will not be disturbed by the LG DLGX3361Vís operation. The consumer will most likely not even notice any sort of noise coming from the dryer. This piece of LG appliance makes use of a Sensor Dry system. This system helps the appliance detect the amount of moisture found on the garments so that the dryer can respond accordingly to the drying need of the load. The Sensor Dry system will adjust the drying time for each load to produce dry garments every time. The innovative features, SteamFresh and TrueSteam enable the dryer to make use of steam to produce dry clothes at the fraction of the usual time. A load can be all dried after only twenty minutes. The LG DLGX3361V is stackable with any compatible washer. This way, the consumer will not have problems with space even if he opts to buy this heavy duty separate dryer. The control panel used has a dual LED display and intelligent controls that provides the dryer with a sophisticated, modern look. The intelligence of the design also makes it easy for the consumer to select the right settings. The stainless steel drum is durable and rust-free. Even after several loads have been dried in the LG DLGX3361V, the drum will not show wear and tear according to its actual age. It will look much newer. The LG DLGX3361V is sleek in graphite steel. Because it is stackable, the LG DLGX3361V will not take up much extra space. It can stay in the same room as the compatible washer. With so many drying programs available, most consumers will find the right combination of settings for each load. There is a safety lock that prevents the door from opening when it is in operation. Quiet operation should help in keeping the laundry area peaceful and serene. The LG DLGX3361V is ADA compliant. So, it can be safely used by the disabled with little or no supervision. The consumer should not expect extra energy bill savings as this product is not Energy Star compliant.